ACT GROUP is an International sports and leisure industrial integration service provider, involving in research & development, production, sales and service. 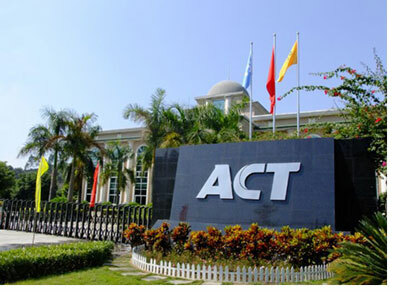 Founded in 2002, ACT was the earliest large-scale domestic manufacturer of artificial grass and stadium seats, and also the first batch of Chinese National Pilot Base of Sports Industry. Headquartered in Guangzhou, ACT owns two manufacturing bases in Zengcheng, Guangzhou and Xinxiang, Henan, with key products covering artificial grass, stadium seating, all kinds of sports surface solution, sports facilities and etc. ACT is capable of providing integrated service such as culture and sports venues consulting & design, advertising planning and creativity, manufacturing, installation commissioning, operation & management, maintenance. And as always, ACT is committed to providing customers with overall cultural and sports industry integrated solutions. Rooted in China, with global vision, adhering to the "Innovative, Professional, Integrity, People-oriented" enterprise values, ACT GROUP has successfully built a global marketing network and perfect service system, developed domestic & foreign consumption market and exported products to all over the world. With its strong R&D strength, professional manufacturing level and forward-looking strategic decision, ACT GROUP was recognized as Guangdong Province sports field materials and products engineering technology research center. As an industry leading brand and high-tech enterprise, ACT has involved in the drafting national standards for many times. And ACT actively cooperated with big domestic and oversea events including: 2007 Kunming National Disabled Games,2008 Beijing Paralympic Games ,2010 Guangzhou Asian games ,2012 Tianjin Universidade,2012 Haiyang 3rd Asian Beach Games,2013 Nanjing Asian Youth Games,2013 Tianjin East Asian games,2014 Nanjing Youth Olympic Games,2016 Brazil Olympic Games. "Through continuous innovation, become a highly respected International Sports Leisure Industry leader" is the enterprise vision of ACT GROUP. Looking forward to the future, ACT will continue to stay the core value proposition of LOVE CREATES MIRACLE, make forward-looking development strategy, improve the advanced production technology and innovate management idea. Together with Global sports industry peers, ACT will to pilot into a more splendid new mileage!